On Tuesday, students walk through the freedom expression tunnel. // Photo by Efrain Arias-Medina Jr.
achel Gallardo, senior nutrition and foods major, was crowned the Top of the Rock during halftime of the App State vs. South Alabama football game. “I won it in high school and it was crazy and it’s even crazier now because out of 19,000 people you’re the one,” Rachel Gallardo said. “I’m so thankful.” Chancellor Sheri Everts crowned Rachel Gallardo on the field and embraced her. Rachel Gallardo was the representative from the College Diabetes Network: Broken Pancreas Club, for which she is the treasurer. 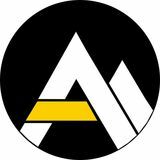 “The main goal of the club is to create a community at Appalachian State of diabetics and their allies that can support one another, and come together to help other people affected by diabetes,” Wheeler Davis, vice president of CDN and sophomore biology student, said in an email. Davis started the club with his girlfriend, Abby Pepper, senior political science major, freshman year when they realized there was no community for diabetics on campus. Rachel Gallardo said the organization educates and advocates for college students with Type 1 and Type 2 diabetes. “We are here to set up a support network,” Rachel Gallardo said. “You can go somewhere and look at someone and you know exactly what they are going through.” Although the nomination meant CDN won homecoming points, that’s not why Rachel Gallardo wanted to run. “We can really make our club be known and be heard,” Rachel Gallardo said. “I really wanted to be the megaphone for this organization.” Rachel Gallardo was diagnosed with Type 1 diabetes at 3 1/2 years old. “This December will be 18 years. It’s a struggle,” Rachel Gallardo said. “I’ve had to learn how to advocate for myself growing up so I really like being a part of this organization. We can help teach newly diagnosed diabetics and help create a support network.” Rachel Gallardo stood next to her dad, Juse Gallardo, as she was announced as the Top of the Rock winner. Juse Gallardo said he was proud of her and that it was almost a crying moment for him. He came home three days early from a business trip in Italy to be there. Her mom, Donna Gallardo, was standing on the sideline when Rachel Gallardo was announced the winner. “It’s extra special because I’m a 1989 grad,” Donna Gallardo said. “I just couldn’t believe it. It was like it happened, but is this real?” Donna Gallardo said she took off running down the sideline when it was announced even though she said she does not run. periencing unpleasant things during a meditation session can help students to deal with negative emotions. “So you might be feeling sad or lonely, and instead of dwelling on that, our meditation practice teaches us to observe those things and allows us to explore what we need in response to that and also allows ourselves to be gentle with ourselves,” Cavallaro said. Although the September classes have already begun, there are sessions in October and November individuals can register for through AppSync. The classes are free and take place in the Plemmons Student Union. Students are required to read the book, “The Mindful Twenty-Something: Life Skills to Handle Stress…and Everything Else” by Holly Rogers, which is available for free through course reserve in the Belk Library and Information Commons or online. and Guinness Storehouse. Professor Adrian Rice, an Irish native who teaches the first-year seminar, Soul-Sustaining Arts, will also go on the trip with the scholars. Despite knowing Dublin, Rice will experience some places for the first time alongside the students. “The irony is that those are places, because I’m from Ireland, I’ve never actually bothered to go to them,” Rice said. “So in a bizarre way I’m going to see things with their eyes for the first time too.” Brown said she is glad Rice is joining them she believes Rice will be a valuable addition to the trip. “He’s definitely going to be a great, positive benefit to this trip because he can tell his stories and he obviously has a bunch of connections in Ireland,” Brown said. Both Krell and Brown said the trip will not solely serve as an enjoyable and educational experience, but also a bonding one for the Chancellor’s Scholars. “I feel like we’re at the point where we know each other, but we can still know a lot more about each other. I think this trip will help with that a lot,” Krell said. Brown shared Krell's sentiment and was hopeful that the trip would unify the scholars. “Us Chancellor’s Scholars are trying to get together and meet more," Brown said. "We really want to connect with each other, but we just don’t have time right now, so hopefully the trip will help with that." These are two teams that share a lot of similarities. Both the Mountaineers and the Red Wolves opened up Sun Belt play this past week, with Arkansas State taking a 28-21 loss on the road to Georgia Southern and App State defeating the South Alabama Jaguars on Homecoming, 52-7. Both teams have also played road games against top 10 opponents, the Mountaineers losing a nail-biter to the Penn State Nittany Lions, 45-38 in overtime and the Red Wolves losing to the Alabama Crimson Tide 57-7. Both teams also sport dominating quarterbacks, with App State’s Zac Thomas currently rated No. 4 in the country in quarterback rating while Arkansas State’s Justice Hansen was tabbed as the Sun Belt’s preseason offensive player of the year. Like last week with South Alabama, this will be App State’s third ever meeting with the Red Wolves and the series is currently tied at 1-1. The Mountaineers got the best of Arkansas State in 2014, winning 37-32 while the Red Wolves spoiled App State’s undefeated Sun Belt record in 2015, getting the win in Boone, 40-27. The Mountaineers’ all-time record of 608-337-28 ranked No. 16 all-time while Arkansas State’s 468-484-37 ranks No. 97 of 130 teams. Jalin Moore #25 Running Back Rushed for 242 yards and four touchdowns in last two games, averaging nearly 9 yards per carry. 3 KEY POINTS Smart Passing Game: In the Mountaineers’ ﬁrst Sun Belt game against South Alabama, two interceptions were thrown and App State only managed 169 passing yards on the day, over 100 yards below what their average was heading into the game. The passing game has been the catalyst of the offense so far this season, so the Mountaineers will have to ﬁnd a way to make it work against the Red Wolves. App State’s defense has been one of their biggest keys to success this season, allowing just 23 points over their last three games, an average of just 7.6 per game. But Arkansas State has averaged nearly 500 yards of offense per game this season so this will be the defense’s ﬁrst real test since playing Penn State. The Mountaineers have rushed for nearly 800 yards and 10 touchdowns as a team over their past two contests, an average of 390 yards per game. The Red Wolves average 244.4 rushing yards per game to only 148.0 passing yards, so running the football will be the key to scoring. This should not be a problem for App State as head coach Scott Satterﬁeld has said that a number of his backup running backs are capable of starting. about the motivation this brings to the team, Easley had plenty to say. “To be a female athlete and hold that title is such a lifelong dream and accomplishment, and I'm so proud of all the women out there and the university for celebrating it,” Easley said. The team is proud to be representing the women alumnae who made it possible for them to be playing today and are grateful to the university for allowing them to celebrate this milestone. The women will carry this pride along with the momentum from last weekend’s winning into this weekend’s contest against Coastal Carolina and improve on their already successful season. having a budget of just $1,200 with no scholarships but not letting these obstacles deter her players. “I had some of the hardest working young ladies I’ve ever seen,” Watson said. “They worked so hard, and they’d come to practice and give it everything they had.” Over 100 field hockey alumnae were also honored at halftime of the field hockey game against Louisville and had the chance to address the current team at practice. Current field hockey player, junior midfielder/ defender Ali Williams said she was thrilled at the chance to meet some former players. nothing,” Williams said. “It’s really great to have a place we can put all of our stuff. It sounds so simple just being able to come to practice and be able to just go out here and be ready. Before, we would sit in our cars because we didn’t have a place to sit. I think it’s made a huge difference in our attitude.” Women’s sports have come a long way in 50 years, but there is still progress to be made. Athletic director Doug Gillin finished the festivities at the Trailblazers Dinner with a quote that captured it all. “We’ve come a long way, and we still have a long way to go,” Gillin said. but he was not clear on any identities or potential charges. Kenneth Simpson, tour and production manager for Migos, and Danny Zook, manager of Migos, did not comment at the time. It wasn’t until early in the morning on April 6 that Boone police released a statement. Boone police officers working security at the Holmes Convocation Center noticed an “obvious odor of marijuana coming from the band’s vehicle” as it left. Officers stopped the vehicle on NC Highway 105 where a search of the vehicle led to three people being charged. The troubles didn’t end there. Migos’ payment for performing was put on hold the following day. Students complained about Offset not performing and some questioned the motives of Boone police pulling the vehicle over. With April 5 behind them, Dustin Evatt-Young said he hopes the public reactions to the arrests does not create a barrier for bringing more diverse performances to campus. Bringing Migos to App The official announcement about Migos’ concert in the Holmes Convocation Center was on Feb. 20, but the work to get Migos to App State began long before that. Choosing the acts that perform at App State isn’t just a one-person job within the Appalachian Popular Programing Society. Members of the council get together and brainstorm a list of potential performers. Community reactions to the events after the Migos concert. public online, on March 28. “Can you please make tickets available online without a ticket code for MIGOS? We have the OK to move forward on that now,” Ostrow wrote to Babay. The final ticket count for the Migos concert was 4,531, which was 969 tickets short of a sell out. The full story will be posted online on October 10th, 2018. 2 raised over $2,500. The board members will vote in November on how to use the money. The money will likely be used to raise the salaries of teachers at school and to build a residential unit. The girls travel about 40 minutes one way on their bikes to reach the school. Parents have expressed concern about them riding on the highway, particularly during monsoon season. Recently, several girls were stranded on a bridge by flooding as they tried to reach school. A 35-acre plot of land has already been set aside for the school and boundary wall. However, the cost is $10,000. Dave urges people to continue to donate online. Donators can also leave a note for the girls. In November, Dave will visit the students and bring the notes. Rautee’s memory lives in the efforts made by EDGE and Dave. “What would her life have been like if she had just had a basic education?” Dave asked. “Her gifts, her talents, her creativity, what else could she have done in her life?” Donations can be made at www. educationforgrlsempowerment.org. ogy department. “I’m glad a ton of people don’t know about it so I can come and volunteer,” Renner said. Meyer has had up to 24 volunteers, but he now keeps a smaller volunteer staff of 10. “I recently kept that number down a little bit so I can continue to do all the things I need to do to keep this place running,” Meyer said. One of the other duties of a volunteer is helping prepare for plant sales through propagation and planting seeds. Through propagation they cut off a small section of the “mother” plant and plant that section. The planted section will continue to grow. Meyer holds two plant sales per year to fund the greenhouse. The fall sale focuses on succulents and other hardy plants and the spring sale focuses on outdoor garden plants. The diversity in the greenhouse is largely due to these sales. “Plant sales are cool,” Renner said. “It’s cool to see everything stacked on top of each other. People are like, ‘This one’s mine!’” Meyer has expanded his teaching to the Boone community through a free class called High Country Gardening. It focuses on outdoor gardening and maintenance. While students are welcome to join, the class caters to homeowners and other community members. “The building is not used nearly as much as it should,” Meyer said. “All these beautiful plants and they don’t see the light of education as much as I wish they would.” The biology department plans to build a new greenhouse and conservatory at the old Broyhill Conference Center. Meyer said he encourages students to visit and tour the greenhouse. The greenhouse is open weekdays from 8 a.m to 4 p.m. Students interested in volunteering can email Meyer at meyerja@appstate.edu. flated price.” The group hopes to inform people about what is actually in their cup, where it came from and the people involved in the process. “We want for each individual to choose ethically where they want to get their coffee,” Allen said. However, this is not primarily a coffee club. The founders said the club will be equal parts adventure, service and coffee. They encourage anyone interested in any of these to consider joining. “My biggest hope is that this club can raise awareness of the importance of specialty coffee and supporting local businesses, as well as caring for our environment,” Martin said. “I’m excited to meet people who are just as passionate about these topics and can’t wait to continue learning.” The club has planned a Roan Mountain trash pickup, an on-campus farmer’s market and a roasting session, during which members will be able to roast their own coffee beans at the Bald Guy Brew roaster warehouse. The club will also have study sessions in the warehouse, during which members can drink coffee while they study and do homework. Burleson said there is a lack of responsibility in both the treatment of the environment and within the coffee trade, and this club aims to combat both issues. The members believe that change starts small, but that every small action towards creating change is necessary to make change happen. For anyone interested in being part of the Adventure, Service, Coffee Club, the group will hold an interest meeting on Oct. 3 in the Great Hall of the Living Learning Center at 5:30 p.m.
report from the USC Race and Equity Center released on Sept. 26,graded the status of education of black students at every four-year, non-specialized, public postsecondary institution in the nation. This report rated schools based on representation equality, gender equality, completion equality and the ratio of black students to black faculty. It then averaged each of these scores together and created a report card for each school. ic media broadcasting major and the president of Alpha Kappa Alpha Sorority, Inc., the first African-American sorority, said this might stem from the community not being supportive of the needs of black students. She said that many black students face difficulties when trying to take care of their basic needs such as hair and skin care. Another red flag that this report brings up is the lack of black faculty. There were only 17 black faculty members, according to the report. As of Fall 2017, only 9.7 percent of App State’s faculty is racially and ethnically diverse. Darden said diverse students can have issues making bonds and being vulnerable with white faculty and staff, which impacts whether or not App State can retain diverse students, as students who do make bonds with faculty and staff are more likely to stay. Boone itself, much like App State, lacks diversity. Less than 10 percent of the permanent population of Boone is racially diverse. Carter and Darden both said this can cause diverse students to not come to App State. However, this isn’t a direct issue that App State can resolve, and it's one that it will have to be cognizant of when trying to bring in more diverse students. This is a complex issue, and while App State can do all it can to bring in diverse students, the Boone community needs to do its part to help as well. n Sunday, the Justice Department sued California over its new law that would guarantee net neutrality for the whole state. This law, much like the state's auto emissions laws, would likely cause internet service providers to have to adapt their universal standards to match California’s. Attorney General Jeff Sessions said in an statement that the new law was illegal because the federal government only gave the Federal Communications Commision the power to create rules for internet service providers. “States do not regulate interstate commerce — the federal government does,” Sessions said in a official statement released after the suit was filed on Sunday. Xavier Becerra, the attorney general for California, said in a Tweet that “California will not allow a handful of power brokers to dictate sources for information or the speed at which websites load.” Isn’t the Republican party the party of state’s rights? If memory serves, the Republican party has classically been the party that advocates for limiting the federal government’s power. And yet the Justice Department filed the suit shortly after the bill was signed into law by California Gov. Jerry Brown. The federal government sure didn’t waste time trying to prevent states from asserting their own rights. Sessions and his cronies probably didn’t even wait until the ink dried. California attempting to exercise its rights probably doesn’t fly for the party that installed a former Verizon executive as the chair of the FCC in order to destroy net neutrality. How ironic, considering the whole point of the Grand Old Party’s opposition to the Affordable Care Act for for over 10 years was its concern about the federal government overriding “state’s rights.” It’s obvious; the Republican party only cares about state’s rights when it doesn’t control the federal government. The second Republicans take power, they enact sweeping reforms and state’s rights go flying out the window. ing or any type of assistance. Reeves said he thinks Sesame Workshop should have said something along the lines of “we are accepting of all forms of love, whatever that might look like,” instead of immediately dismissing Saltzman’s statement. This controversy is reflective of the past. Reeves said during the '80s, when “Sesame Street” was popular, a lot of people may not have been openly identified, but did identify within the LGBTQ community. “I already had my life partner, the love of my life. We weren’t living together. All our friends knew, but I don’t think I was professionally out,” Saltzman said. The parallels between Saltzman and Glassman’s relationship and Bert and Ernie’s was recognizable before Saltzman was open about being gay. Sesame Workshop could have handled this better. As a show known for educating a young audience about acceptance, this would have been its chance to make an official statement to those who thought Bert and Ernie were gay all along. “Sesame Street” includes a multitude of ways to address topics like race, family problems and mental illness, so to dismiss the inclusion of the LGBTQ community is an unfortunate decision. "I love your love" by Gaireach. Whatever happened to state’s rights? And that's a wrAPP on another awesome #AppState Homecoming! We hope alumni, students, families, friends and fans had a great time this week+weekend on The Mountain! The Peel Literature and Arts Review is App State’s student-run literary arts publication. We are seeking students to submit their creative works for review and possible publication. Submit your art, music, design, poetry, prose, fashion and more at thepeelreview. submittable.com. Find more information by visiting thepeelreview. com or following us on social media @thepeelreview. Want to lay out this paper? Have a flair for graphic design? 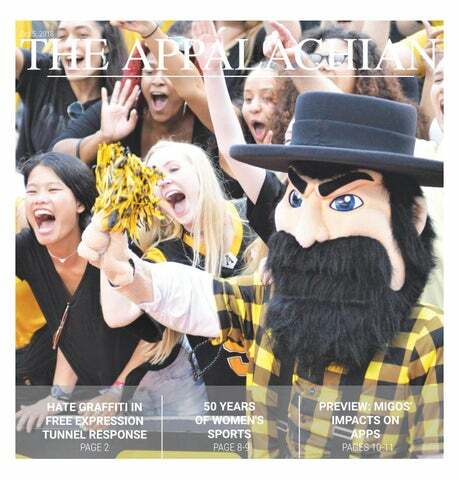 Email editor@theappalachianonline.com to express interest! Experience with Adobe Creative Suite (InDesign, Illustrator, Photoshop) preferred but not required. Opportunities available for student designers of all skill sets.